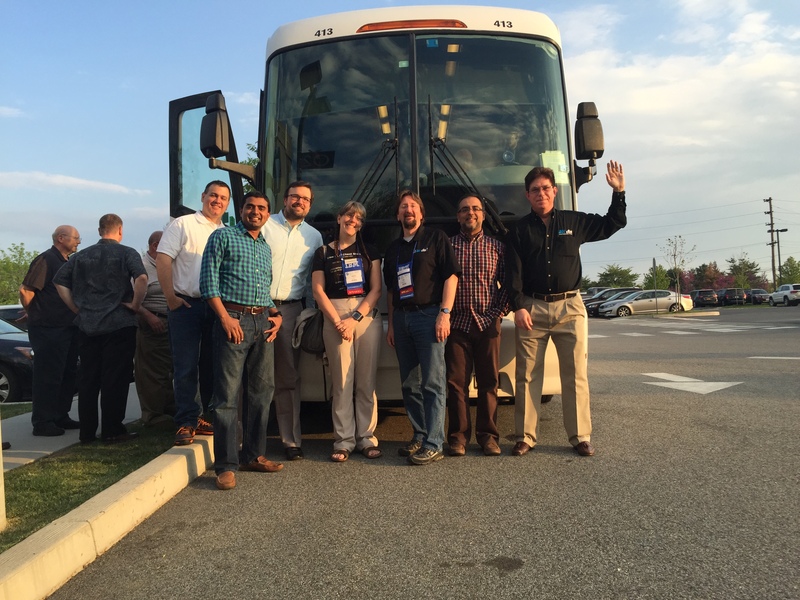 IDUG North America is over for another year. I enjoyed every minute of the conference this year, and was basically going solid from 7 AM to midnight every single day. I look forward to catching up on my sleep at home. I am typically someone who needs a solid 8-10 hours and I don’t drink and don’t party, so this is an unusual pattern for me. I am no longer surprised to meet people at conferences who have read my blog. The thing that surprised me this time was the fact that every single LUW person I talked to knew of the blog and recognized me. I loved speaking to people about technical problems and helping people with directions to investigate with issues they described to me. There was one dinner where I introduced myself to a room of maybe 50 people, and when I mentioned the blog, I got a round of applause. This was much needed motivation for me. The blog is a lot of work and I was in a phase over the last few weeks where I was wondering if I really should be continuing to write it – if I might do better spending the time on it in really pushing a users group in Denver, volunteering for IDUG, or in actually having a personal hobby. It’s hard just looking at the numbers on a computer for me to remember that each of those numbers is a person, and some of them are having trouble finding what they need until they find this blog. 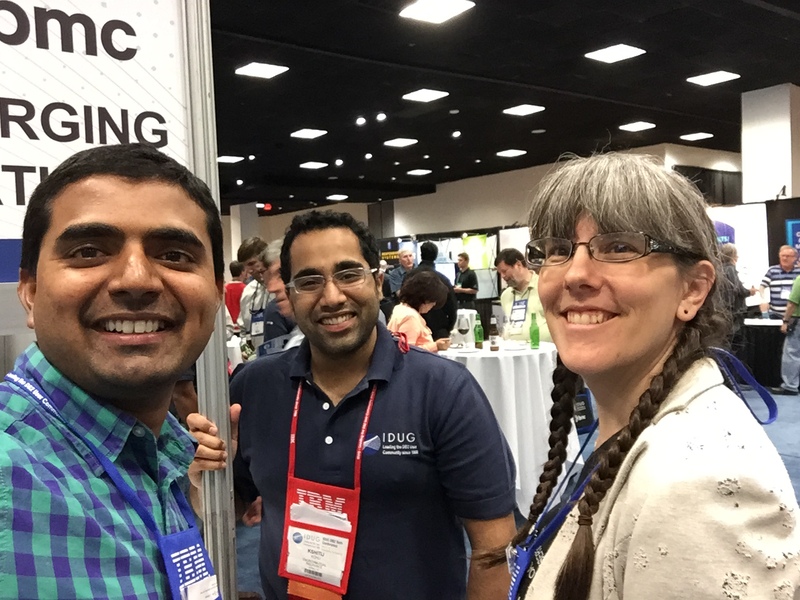 The conference helped me realize that, for me, it is a moral imperative to keep blogging. It really does help people and is one of my ways of contributing to the world. If that sounds cheesy or conceited, I’m sorry, but I don’t take it back. 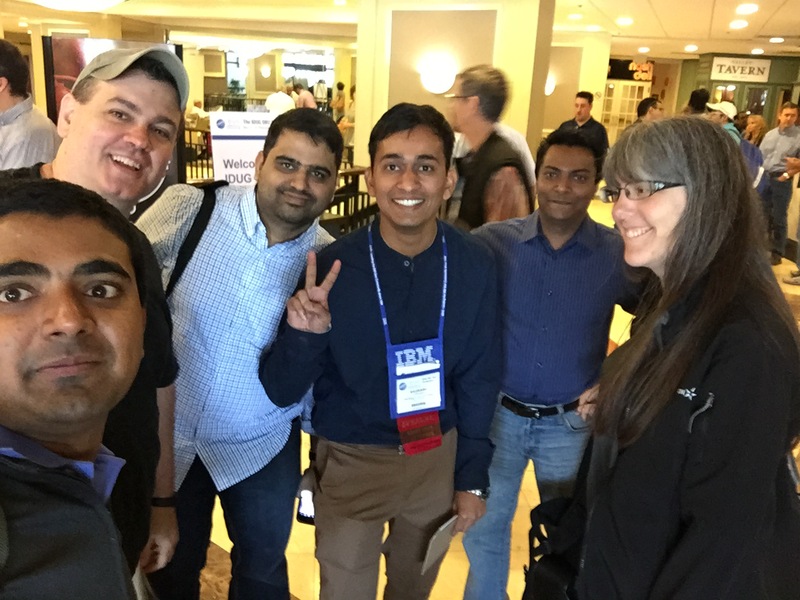 If you read this blog and it helps you, I want you to dedicate some time to paying it forward – mentor another dba or person in your life, start a blog or podcast, record an educational video, volunteer with IDUG, run or contribute to a users’ group, participate in this awesome DB2 community that we have. I really believe that we have something special in the cooperation and knowledge sharing that we participate in. If you’re worried about the future of DB2, this kind of participation is one of the big things that can make a software product successful. I have to call out a few things that were just the most awesome about this conference. 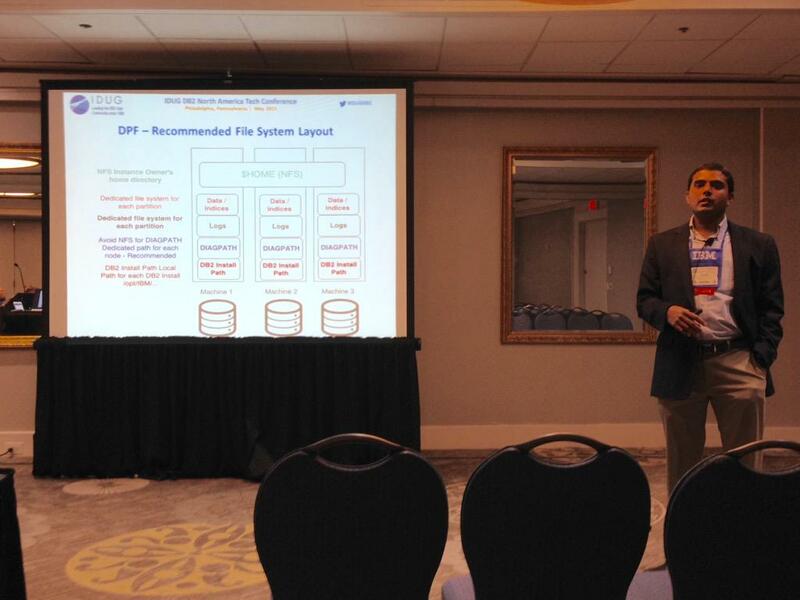 One session that stood out in my mind was E21 – DB2 10.5 New Query Optimizer Features – a Query Optimizer Perspective. It was a session that had such good technical material that several things were over my head – a feeling I really value these days as it becomes harder for me to find advanced technical material that both applies directly to what I do and is also hard to understand. John Hornibrook will be on my priority list for speakers to hear at future conferences. Wow, the thresholds that it sometimes seem so hard to find for some performance metrics were all over this presentation – I have EIGHT blog entry ideas from this session alone, and have a couple of areas I want to do further research on. C12 – DB2 LUW Performance FAQs, volume 5 – solving more puzzles! I got 4 blog post ideas out of this session, and I got a direction for investigating a very specific performance problem that I’ve been fighting for a client. There was an excellent description of how to analyze if your package cache is too large. This session had technical details on pureScale performance that were just excellent, and gave me an excellent direction for a pureScale sandbox that I would like to set up. No blog entry ideas, but I took a lot of notes to go back to later if I get to a place where I get to blog about pureScale. In Melanie Stopfer’s absence Steve should absolutely get the title of best IBM speaker at this conference to me. A speaker I hadn’t noticed at previous conferences is David Kalmuk. I loved how his slides included detailed SQL that could be used to investigate and solve problems. While I don’t get my hands on WLM much outside of a couple of BLU implementations, I still got a few great ideas for technical things to try out of C09 – Rounding up Outlaw Queries in DB2. From E18 – The Latest in Advanced Performance Diagnostics for SQL, I got two great blog entry ideas, and wrote a note about “finally details on how to query the freaking activity event monitor tables” – which is something I’ve struggled with. Also, I loved the insight that mon_get_pkg_cache_stmt only shows completed SQL while mon_get_activity detail shows details for currently executing statements. And finally (D21/19) – Monitoring BLU Acceleration in Depth netted me another blog entry idea and really provided some details I had been missing on how to look at BLU performance. I’m proud to spend time mentoring and supporting newer speakers – people who are speaking for the first or second time. Now granted, this is only my third conference speaking. It is amazing to me how quick it is to become a mentor. My favorite sessions of any conference are the Panels, and both the DB2 LUW pannel and the BLU SIG did not dissapoint. 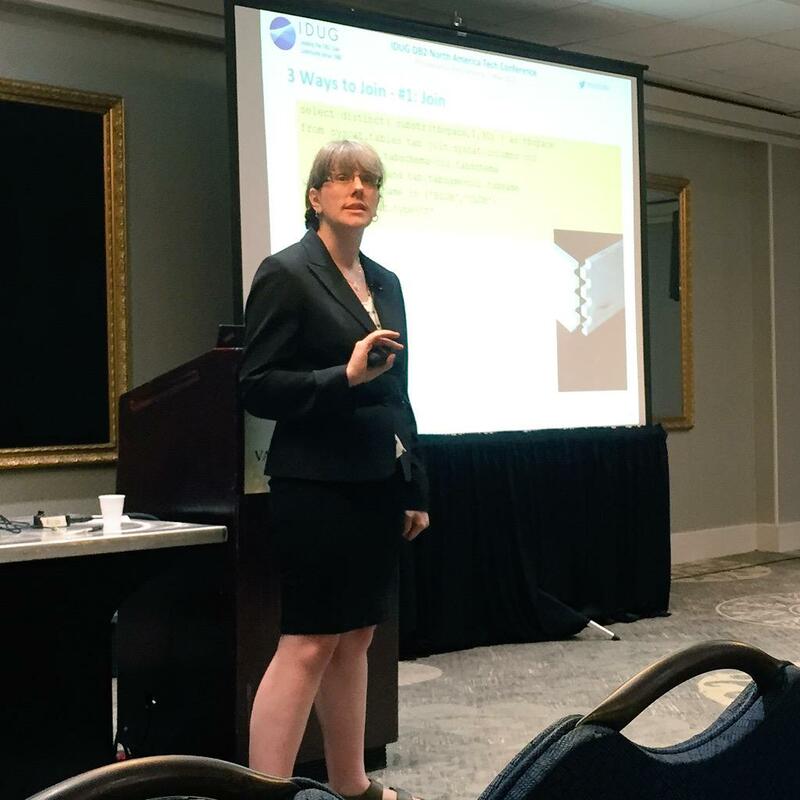 If you’ve ever been in a session that I attended, you probably realize that I’m a big question-asker myself. But that’s not why I like these sessions. I like these sessions to hear the questions that others are asking. I learn so much from what others ask and how these panels seem to go in interesting directions. 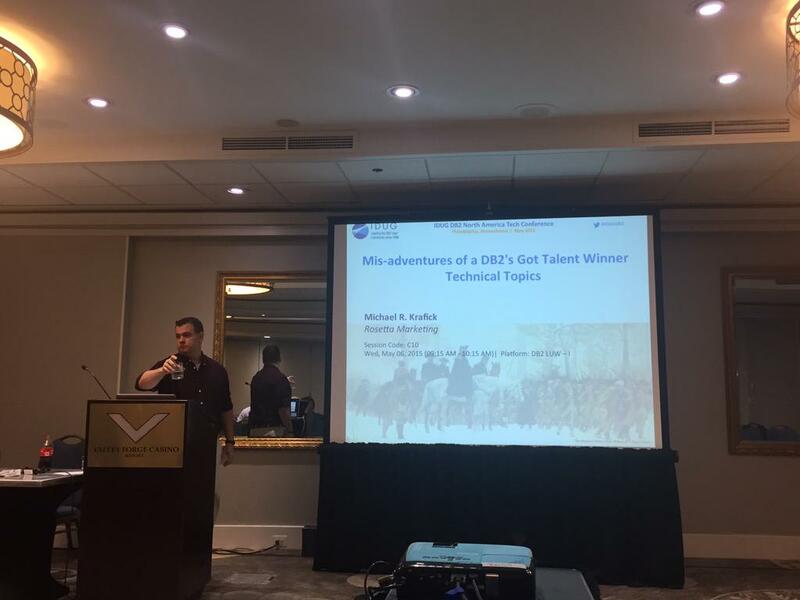 One interesting thing that was emphasized at the Panel on Thursday was the DB2 RFE Community. This allows people to request enhancements to DB2 and vote on which other public requests are most important to clients. In the session, IBM said that you have to mark your request public to have it voted on. However, when I went in to submit one, I could not change it to public. If I look up the top requests for DB2 LUW, they ALL have only one vote. So I think there’s a problem with this feature. Anyone else experience this or have a different experience? I am a hermit and an introvert. I work from home, and enjoy that for the lack of human interaction it requires from me. But at IDUG I completely flip modes and somehow just feed on the energy of social interaction. When I go to IBM Insight, it tends to trigger anxiety and while I still socialize and have a fun time with some people, I get time up in my room alone to recover from that. 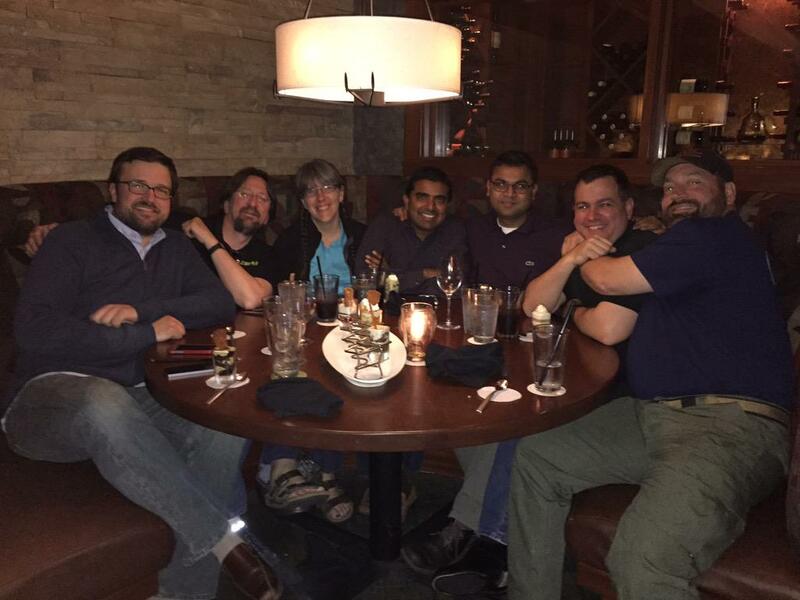 I have a group of IDUG friends that I would rather hang out with than be alone, and that’s saying something for me. 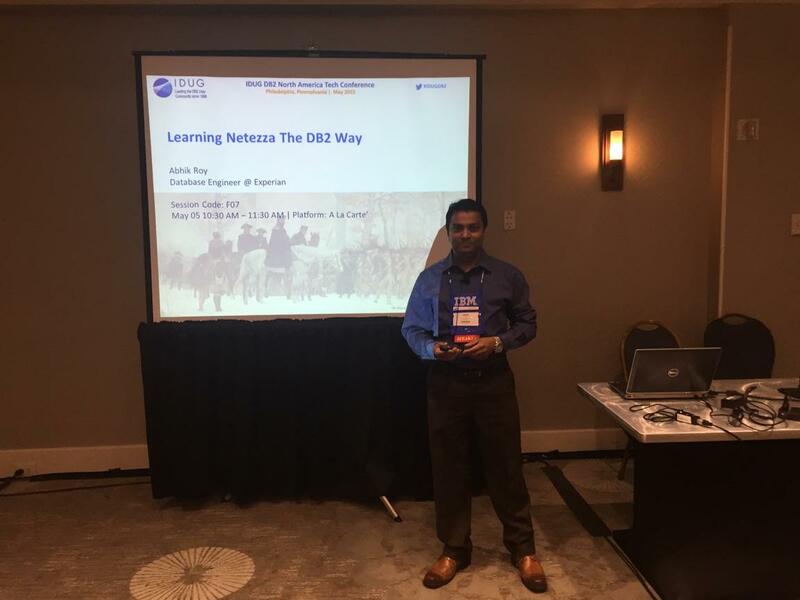 I also make contacts with people in the DB2 community who are just as much DB2 Nerds as I am, and who I can ask technical questions of when I can’t figure something out or when I need additional details for my blog or for a particular technical problem. 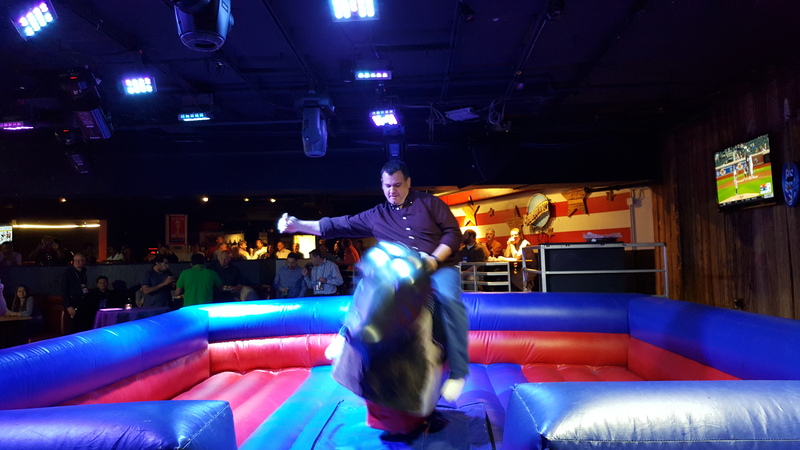 The IBM had a party at a place with a mechanical Bull – Here are a couple of pics of that. 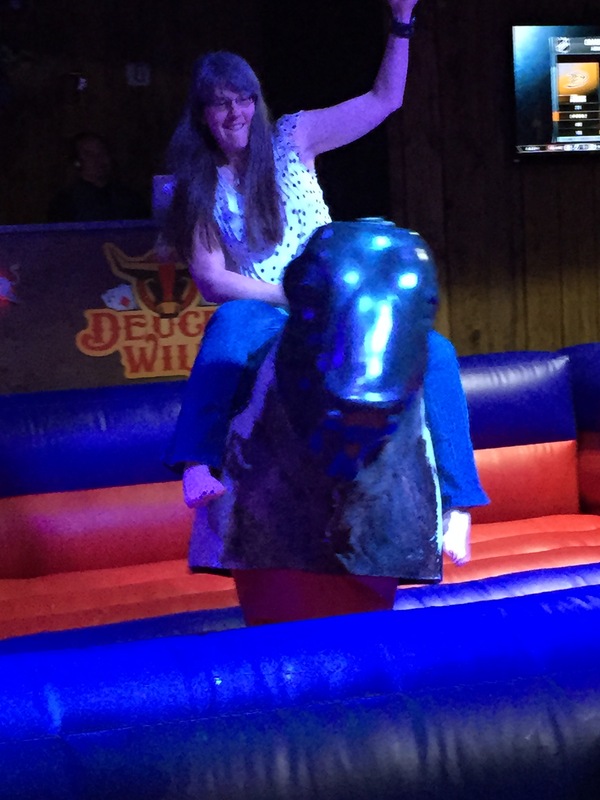 It was hilarious to see my DB2 heroes riding the bull. I’m proud to have worked hard enough to come in second. You should have seen me wandering around the Philly and Denver airports to make that work rather than sitting and relaxing. 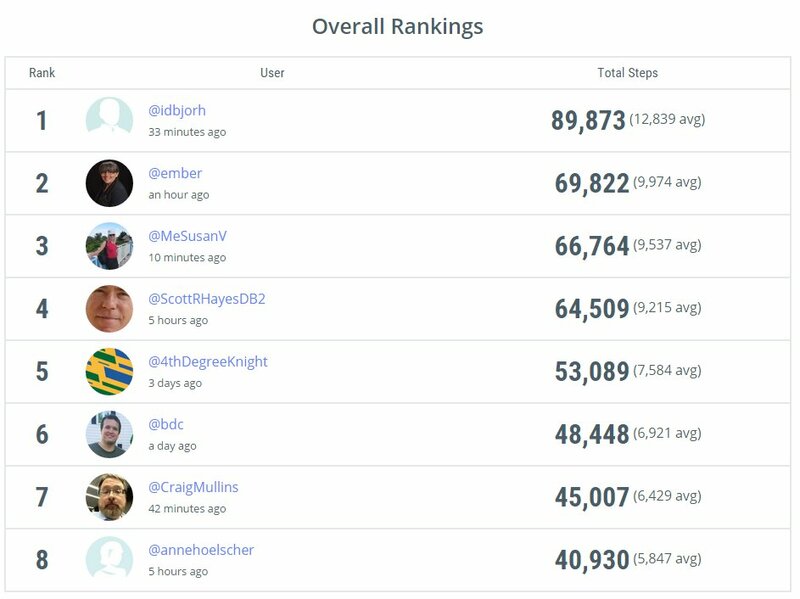 Let’s keep the spirit of competition up – anyone with a fitness tracker can join a new challenge starting May 17 here: https://matchup.io/group/5469/db2-after-idug-challenge. We need at least one more person to join – matchup.io works with a wide range of fitness trackers – join us today. This challenge is different than the one done at IDUG. 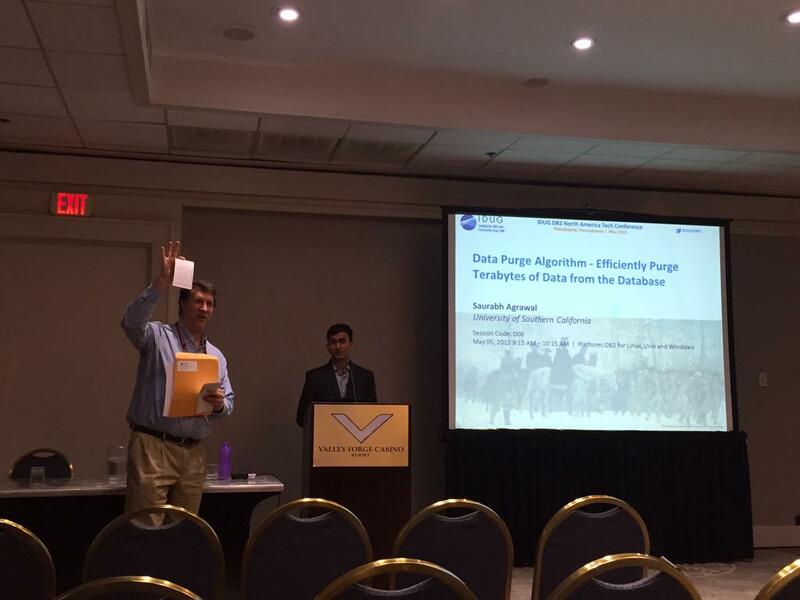 The one at IDUG was an overall-count challenge. This one will pit each person against another person each day, and the one with the most wins at the end is the winner. While I’m limited on what I see and cannot make overall statements about what was best when it was impossible for me to see more than maybe 25% of the sessions, there are a few categories I’d like to recognize speakers or sessions in. The “award” is simply bragging rights. Winning both for the most blog entry inspirations in a single session AND the most blog entry ideas across the whole conference is Steve Rees. I came away with no fewer than 8 blog ideas from one of his sessions, and a whopping total of 12 blog ideas across the 3 sessions of his that I attended. Adam Storm wins for using an awesome restaurant example to both entertain and walk us through BLU inserts, updates, and deletes in E16 – BLU Insert, Update, and Delete – An Insider’s Perspective. He manages to be both entertaining and incredibly informative at the same time. I aspire to work on the entertainment portion of my speaking, and he and Michal Krafick are my role models for this. 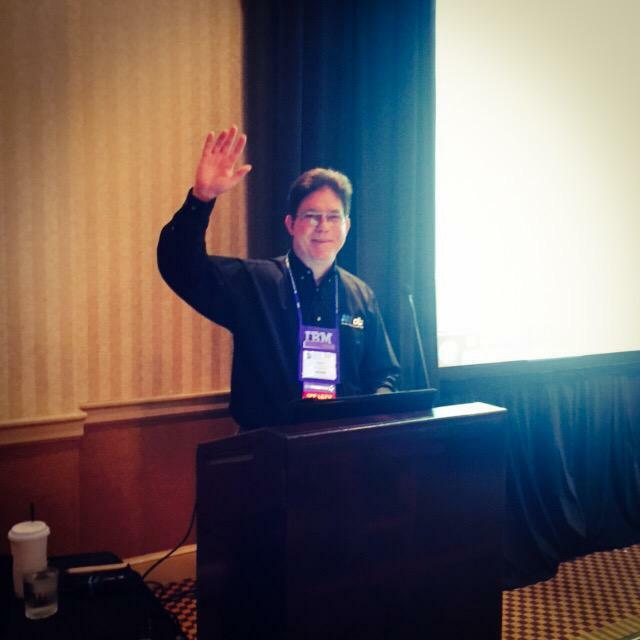 The award for the first presentation I’m downloading when IDUG makes the full audio available Goes to Paul Turpin for C16 – db2batch Tips and Tricks – I was sad to have to miss this session. This award goes to D07 – Top Ten DB2 Explain Tips by John Hornibrook. I’ll be downloading the slides to check this one out, but sure hope they recorded it as well. Scott Hayes. Need I say more? I also love Scott’s contributions to the DB2 community and his work in mentoring DBAs, even when they don’t buy his software. The IDUG North American technical conference next year will be in Austin, TX. Ember – As always, you did a fantastic job in this post. However, you left out the best learning we had from Mike (Krafick) — “Cards Against Humanity” !! I couldn’t help but giggle when I recollect how much fun it was ! Another great blog from Ember! Thanks for the Best Hair award. I and my professional hair and makeup team appreciate that. 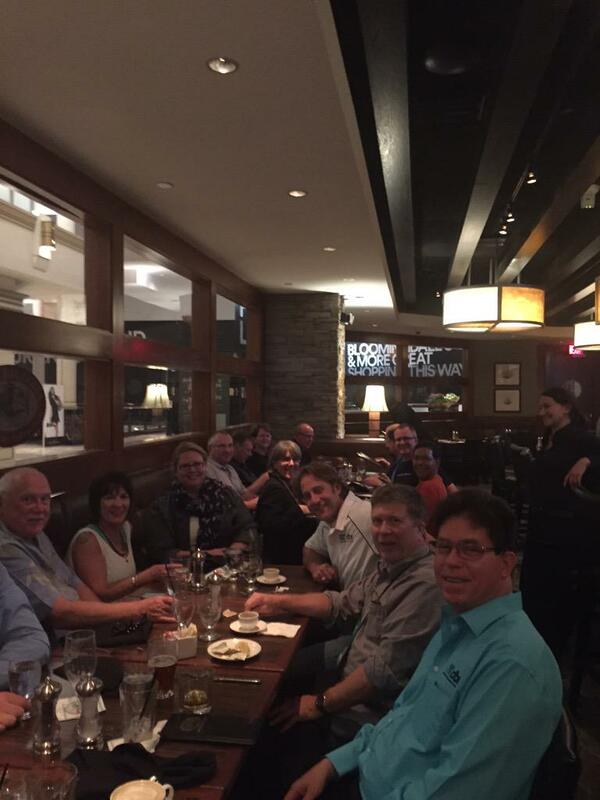 DBI had 52 people at dinner Tuesday night, and I can still hear the roar of applause that everyone gave you. You have achieved success through your passion for helping others. Well done. And kudos for encouraging your readers to pass it on. Session D07 with John Hornibrook, IBM STSM, will be on The DB2Night Show in June. Check our schedule http://www.DB2NightShow.com and register! Paul Turpin’s “db2batch” presentation is available as a DB2Night Show replay. Adam Storm has replays available as well, and David Kalmuk is on our show schedule in June. Enjoy! 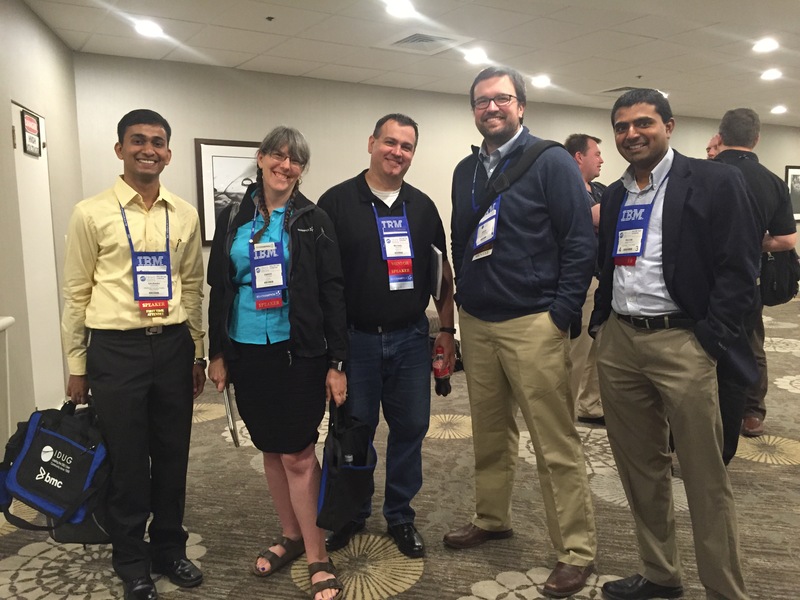 Can’t wait for your blog posts sharing all that IDUG goodness! I will make it to IDUG one day as well, I know I will!